I have practiced and taught Design and Design Presentation for many years. 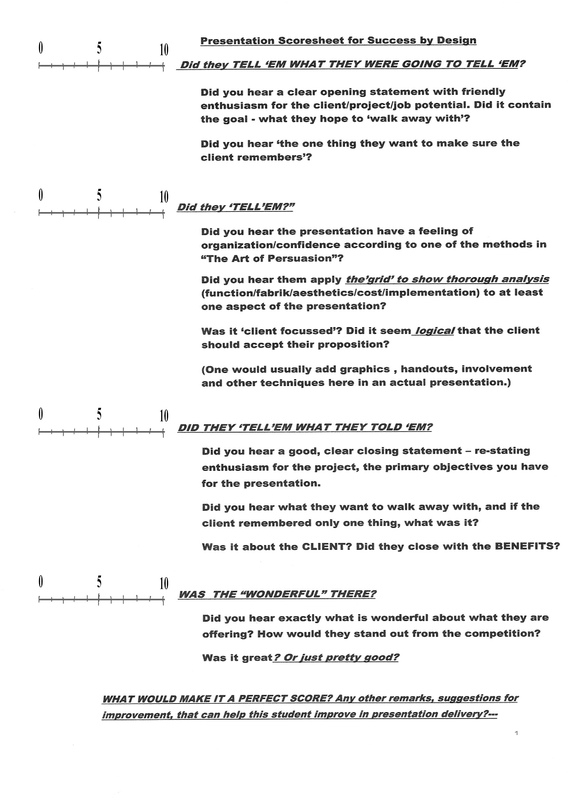 This is a scoresheet I developed for use in my classes, based on the “3 T’s” (a classic presentation sequence – not original). I let each presenter be given all their scoresheets from every classmate. It’s just for audience feedback – I don’t see the sheets (I make my own). The main headings are easy to remember, but each of the T’s has its own little refinements, as below. AND – you should fit as well as you can to the audience (executives, managers, user groups). It doesn’t prevent a little stage craft – like Steve Jobs’ – “Oh, and one last thing…”).